Most Unwilling To Come Down! 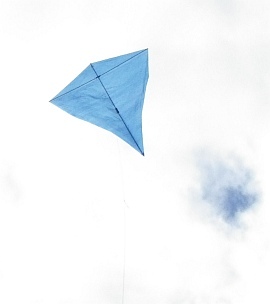 This day proved quite ideal for the newly-constructed Multi Dowel Diamond kite. At the field, the story told by the nearest two online weather-stations seemed to be borne out... Fairly light winds which were gusting into the 'gentle' range. Up to around 19kph that is. Due to the wind direction, a short walk to the opposite side of the reserve was necessary. As is my custom, the bag of kiting odds'n'ends was placed near the foot of a tree, along with the trusty hose-reel winder. The same line is used for all the Multi-Dowel kites - 200 pound braided Dacron. For this Diamond, that would be over-kill in terms of strength. But it only takes a couple of kilos of tension to pull most of the sag out of the line while the kite is in flight. Setup was easy, as it is for most Diamonds. Being a large tail-less design, this one is just as easy to launch as a Delta too. However, staying up was not so easy today! 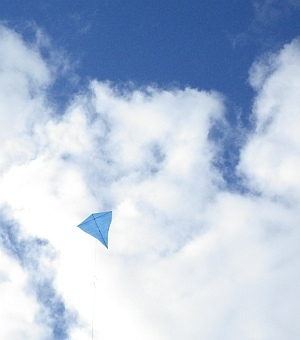 After jogging upwind for just a few steps, the kite bit into 5 - 10kph of breeze and continued to climb on its own. The wind direction and time of day were similar to the ill-fated KAP session of a few days ago. On that occasion the kite tended to fly directly through the sun, from my perspective. However, cloud cover was heavier today which resulted in much less glare when photographing in that direction. Although no thunderstorm activity was forecast, I was still a little uneasy due to the enormous extent of the rain cloud directly overhead! After a while it seemed to blot out half the sky. No rain fell at all, although the grass was damp from a previous shower. The ominous region of gray did not appear to moving downwind either. Perhaps it was still growing in all directions! Or maybe not, since this locality sometimes has complex wind patterns. Due to the influence of the sea on one side and a range of hills on the other. The big blue Diamond appeared a little out of trim, so I took it down and shifted the knot on the upper bridle loop by a cm or so (1/2 inch) to the right. The initial rate of climb seemed a little lethargic too, so I moved the other bridle knot towards the nose a little. This would also help prevent the kite from getting over-powered during gusts. It is a light-wind design after all. With the kite holding height at around 100 feet on 150 feet of line, it was a chance to take some photos and video. Pity about the overall light levels - but what lighting there was, was from almost directly behind the thin plastic sail. Which worked out OK! All of a sudden the Multi Dowel Diamond kite was pushed overhead by some rising air. Then a small bird with elliptical wings soared past, 1 or 2 hundred feet above the kite. Just gliding, evidently seeing no need to flap! Around this time, sunlight was coming in and out as thinner portions of the cloud cover moved across. With all the camera work out of the way, I cautiously let out some more line, to 60 meters (200 feet). The big Diamond still had some hints of leaning to the left. So, it will be necessary to check the horizontal spar curvature later, and file off some wood on one side. Less wood means more curvature on that side when the bow-lines are connected under tension with the toggle-and-loop. The leaning problem was quite minor, so I let out flying line to 75 meters (250 feet) and waited for the kite to rise back up to its 50-60 degree line angle. By now, the mid-afternoon air seemed to be smoothing out. The sun had been obscured for more than 10 minutes. Finally I let out to 90 meters (300 feet) of line and enjoyed seeing the big Diamond sit very steadily at over 250 feet off the grass. The pointy tail end was shifting left and right over just several centimeters (an inch or two), which was barely perceptible at that height. Occasionally the whole kite would shift left or right by several meters in response to small changes in the wind's direction. 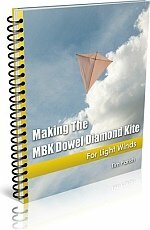 For many minutes on end, the Multi Dowel Diamond kite just sat there at around 65 degrees of line angle. Satisfyingly stable! I suspected that several square kilometers were in weak lift, or at least having multiple regions of lift, close together. As if to confirm my thoughts, three white cockatoos flew past the kite. The birds didn't flap their wings for the entire width of the reserve, before flapping briefly to alight in the massive pine tree across the road. The end of my small son's school day was approaching. So it was time to bring down the kite. Well, I tried, but at 150 feet off the grass, it simply refused to come down! At one point the drop-sheet plastic sail rustled and I felt a kilo or two of extra tension come on the line. With the kite vertically overhead! It even over-flew briefly before finally sinking back downwind. But not very far - the big Diamond still remained almost overhead until the bridle was in my hand. I really could not have asked for more on the first outing with the Multi Dowel Diamond kite. Except perhaps a bit more light for better photos! This design seems very comfortable in the 8kph to 20kph range of wind speeds.